This double biography takes the reader through motor racing in the 1950s via the exciting and dramatic careers of two of Britain’s finest racing drivers. Mike Hawthorn was a brash extrovert who courted controversy all his adult life, whereas Peter Collins was a cool charmer loved by all who knew him. Their great friendship began when they came together at Scuderia Ferrari in 1957, but it dulled their competitive edge and although Mike won the World Championship in 1958, they only won two GPs between them. Their story ends in sadness with Peter’s death in the 1958 German GP and Mike’s a few months later in a road accident. 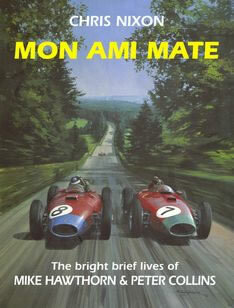 MON AMI MATE is a fascinating account of their rollercoaster careers. 300 photographs approx.